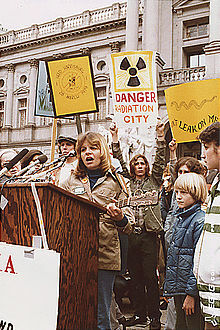 There were many anti-nuclear protests in the United States which captured national public attention during the 1970s and 1980s. These included the well-known Clamshell Alliance protests at Seabrook Station Nuclear Power Plant and the Abalone Alliance protests at Diablo Canyon Nuclear Power Plant, where thousands of protesters were arrested. Other large protests followed the 1979 Three Mile Island accident. A large anti-nuclear demonstration was held on May 6, 1979, in Washington, D.C., when 125,000 people including the Governor of California, attended a march and rally against nuclear power. In New York City on September 23, 1979, almost 200,000 people attended a protest against nuclear power. Anti-nuclear power protests preceded the shutdown of the Shoreham, Yankee Rowe, Millstone I, Rancho Seco, Maine Yankee, and about a dozen other nuclear power plants. On June 12, 1982, one million people demonstrated in New York City's Central Park against nuclear weapons and for an end to the cold war arms race. It was, and is, the largest anti-nuclear protest and the largest political demonstration in American history. International Day of Nuclear Disarmament protests were held on June 20, 1983 at 50 sites across the United States. In 1986, hundreds of people walked from Los Angeles to Washington, D.C. in the Great Peace March for Global Nuclear Disarmament. 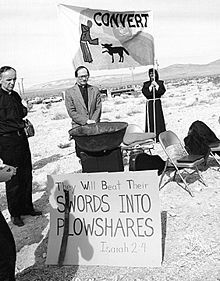 There were many Nevada Desert Experience protests and peace camps at the Nevada Test Site during the 1980s and 1990s. On May 1, 2005, 40,000 anti-nuclear/anti-war protesters marched past the United Nations in New York, 60 years after the atomic bombings of Hiroshima and Nagasaki. This was the largest anti-nuclear rally in the U.S. for several decades. In the 2000s there were protests about, and campaigns against, several new nuclear reactor proposals in the United States. In 2013, four aging, uncompetitive, reactors were permanently closed: San Onofre 2 and 3 in California, Crystal River 3 in Florida, and Kewaunee in Wisconsin. Vermont Yankee, in Vernon, closed in 2014, following many protests. Protesters in New York State are seeking to close Indian Point Energy Center, in Buchanan, 30 miles from New York City. 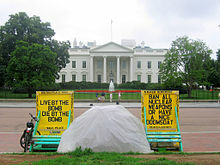 The anti-nuclear movement in the United States have undertaken public protests and acts of civil disobedience which have included occupations of nuclear plant sites. Other salient strategies have included lobbying, petitioning government authorities, influencing public policy through referendum campaigns and involvement in elections. Anti-nuclear groups have also tried to influence policy implementation through litigation and by participating in licensing proceedings. Pacific Gas & Electric planned to build the first commercially viable nuclear power plant in the USA at Bodega Bay, a fishing village fifty miles north of San Francisco. The proposal was controversial and conflict with local citizens began in 1958. In 1963 there was a large demonstration at the site of the proposed Bodega Bay Nuclear Power Plant. The conflict ended in 1964, with the forced abandonment of plans for the power plant. Attempts to build a nuclear power plant in Malibu were similar to those at Bodega Bay and were also abandoned. On November 1, 1961, at the height of the Cold War, about 50,000 women brought together by Women Strike for Peace marched in 60 cities in the United States to demonstrate against nuclear weapons. It was the largest national women's peace protest of the 20th century. About 1,500 women led by Dagmar Wilson gathered at the foot of the Washington Monument and President John F. Kennedy watched from a window at the White House. The protest helped "push the United States and the Soviet Union into signing a nuclear test-ban treaty two years later". On 22 February 1974, Washington's Birthday, organic farmer Sam Lovejoy took a crowbar to the weather-monitoring tower which had been erected at the Montague Nuclear Power Plant site. Lovejoy felled 349 feet of the 550 foot tower and then took himself to the local police station, where he presented a statement in which he took full responsibility for the action. Lovejoy's action galvanized local public opinion against the plant. The Montague nuclear power plant proposal was canceled in 1980, after $29 million was spent on the project. August 1, 1976: 200 residents rallied at the future Seabrook Station Nuclear Power Plant site in New Hampshire, and 18 were arrested for criminal trespass. August 22, 1976: 188 activists from New England were arrested at the Seabrook site. May 2, 1977: 1,414 protesters were arrested at Seabrook Station Nuclear Power Plant. The protesters who were arrested were expected to be "released on their own recognizance", but this did not happen. Instead, they were charged with criminal trespass and asked to post bail ranging from $100 to $500. They refused and were then held in five national guard armories for 12 days. The Seabrook conflict, and role of New Hampshire Governor Meldrim Thomson, received much national media coverage. May 13, 1977: 550 protestors were freed after being detained for thirteen days. May 25–27, 1980: Police use tear gas, riot sticks and dogs to drive 2,000 demonstrators away from the Seabrook site. May 24, 1986: 74 anti-nuclear demonstrators were arrested in protests. October 17, 1988: 84 people were arrested at the Seabrook plant. June 5, 1989: hundreds of demonstrators protested against the plant's first low-power testing, and the police arrested 627 people for trespassing; two state legislators, one from Massachusetts and one from New Hampshire, protested. August 6, 1977: The Abalone Alliance held the first blockade at Diablo Canyon Power Plant in California, and 47 people were arrested. August 1978: almost 500 people were arrested for protesting at Diablo Canyon. April 8, 1979: 30,000 people marched in San Francisco to support shutting down the Diablo Canyon Power Plant. June 30, 1979: about 40,000 people attended a protest rally at Diablo Canyon. September 1981: close to 2,000 arrests were made during attempted occupation of Diablo Canyon. In April 2011, there was demonstration of 300 people at Avila Beach calling for the closure of Diablo Canyon nuclear power plant and a halt to its relicensing application process. The event, organized by San Luis Obispo-based anti-nuclear group Mothers for Peace, was in response to the Fukushima nuclear disaster in Japan. There was opposition to the Trojan Nuclear Power Plant from its inception, and this included non-violent protests organized by the Trojan Decommissioning Alliance. The Alliance organized the first major direct action protest at Trojan in August 1977, and a second round of protests took place that November. Scores of demonstrators were arrested, and in December 1977 a jury found 96 protesters not guilty of criminal trespass. There was another protest in August 1978, which led to about 280 arrests. In the 1980s and early 1990s, Portland activist Lloyd Marbet and his group, Forelaws on Board, "became Trojan's leading opponents". Each of the 2,500 pews in the cathedral was covered with a cloth panel, decorated by The Ribbon International anti-nuclear group. Assembly of the Ribbon gets underway at the United States Capitol, Washington, D.C. The interfaith service for peace and nuclear disarmament, held on August 3 at the Washington National Cathedral, was attended by 5,000 people. Cathedral staff reported that it was the second-largest crowd ever hosted in the building. Over 4,000 handmade cloth panels were on display during the service. Each pew was decorated by The Ribbon International group, and additional cloth ribbons were draped and tied in various locations around the building. Twenty bagpipers in Highland dress led a procession of 200 people carrying ribbons into the cathedral. The service also included dancing, meditation, and a performance by the Howard University Gospel Choir. Survivors of the Hiroshima and Nagasaki bombings were in attendance both at the church service and during The Ribbon event the next day. When all 27,000 individual cloth panels were joined together on August 4, it created a ribbon 18 miles (29 km) long. Don Wilcox of The Craft Report described it as "the largest collaborative craft event in American history". The Ribbon wrapped around the Pentagon building, through the Pentagon parking lot, down the footpaths alongside the Jefferson Davis Highway and Washington Boulevard, crossed the Potomac River into Washington, D.C. at the Arlington Memorial Bridge, and travelled into the National Mall area. The Ribbon then went past the Lincoln Memorial, along the south side of the Lincoln Memorial Reflecting Pool, continuing east along the National Mall, and around the U.S.Capitol Building. It then turned west along the north side of the National Mall, went around the Ellipse by the White House, passed the Lincoln Memorial, crossed the Potomac River again and returned to the Pentagon. When the chain of panels was completed, hundreds of balloons were released near the Lincoln Memorial. The entire route was lined with people, and crowds gathered at the three designated speaking areas (the Pentagon, the Lincoln Memorial, and the Capitol). Singers, including Pete Seeger and Tom Chapin, rotated between the three stage areas, performing anti-war songs. Even before the Three Mile Island accident, the nuclear industry was facing considerable adverse public opinion. A "sizeable and tenacious opposition movement had caused significant delays" in the licensing and construction of new power plants in the United States. The TMI accident stimulated a rise in anti-nuclear sentiment. 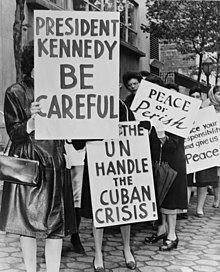 The American public were concerned about the release of radioactive gas from the Three Mile Island accident and many mass demonstrations opposing nuclear power took place across the country in the following months. The largest one was held in New York City in September 1979 and involved two hundred thousand people; speeches were given by Jane Fonda and Ralph Nader. The New York rally was held in conjunction with a series of nightly “No Nukes” concerts given at Madison Square Garden from September 19 through 23 by Musicians United for Safe Energy. In the previous May, an estimated 65,000 people, including the Governor of California, attended a march and rally against nuclear power in Washington, D.C.
June 2, 1979: about 500 people were arrested for protesting about construction of the Black Fox Nuclear Power Plant in Oklahoma. February 1982: following years of legal action and protests, it was announced that the plant would not be built. August 12, 1978: Forty protesters are arrested at the first anti-Shoreham demonstration. June 3, 1979: following the Three Mile Island accident, some 15,000 people attended a rally organized by the Shad Alliance and about 600 were arrested at Shoreham Nuclear Power Plant in New York. 1989: after many years of protests, the completed Shoreham plant was closed without generating any commercial electrical power. April 28, 1979: 15,000 people demonstrated against the Rocky Flats Nuclear Weapons Plant, making the link between nuclear power and nuclear weaponry. October 15, 1983: Large demonstration at Rocky Flats. August 10, 1987: 320 demonstrators were arrested after they tried to force a one-day shutdown of the Rocky Flats nuclear weapons plant. August, 1989: An estimated 3,500 people turned out for a demonstration at Rocky Flats.Organized by the Rocky Mountain Peace and Justice Center. *August 8, 1989: An estimated 2,500 people turned out for a simultaneous demonstration at the Denver, CO Capitol Rally to protest Rocky Flats. Organized and hosted by Environmental Information Network (EIN), Inc. In 1979, Abalone Alliance members held a 38-day sit-in at Californian Governor Jerry Brown's office to protest continued operation of Rancho Seco Nuclear Generating Station, which was a duplicate of the Three Mile Island facility. In 1989, Sacramento voters voted to shut down the Rancho Seco power plant. On June 12, 1982, one million people demonstrated in New York City's Central Park against nuclear weapons and for an end to the cold war arms race. It was the largest anti-nuclear protest and the largest political demonstration in American history. The Seneca Women's Encampment for a Future of Peace and Justice was located in Romulus, in Seneca County, New York, adjacent to the Seneca Army Depot. It took place mainly during the summer of 1983. Thousands of women came to participate and rally against nuclear weapons and the “patriarchal society” that created and used those weapons. The purpose of the Encampment was to stop the scheduled deployment of Cruise and Pershing II missiles before their suspected shipment from the Seneca Army Depot to Europe that fall. The Encampment continued as an active political presence in the Finger Lakes area for at least 5 more years, supporting anti-nuclear education and the connections between eco-feminism, non-violence, the need for civil disobedience and ideas of perma-culture, and sustainability. In the 1970s and 1980s there were many protests at Vermont Yankee Nuclear Power Plant which attempted to block access to the plant. October 2006: 26 people were arrested outside the Brattleboro offices of owner Entergy Nuclear; the demonstration drew about 200 people. April 27, 2007: Seven anti-nuclear activists were arrested after chaining themselves to a fence at Vermont Yankee nuclear power plant. The protesters, who call themselves the "Raging Grannies", wanted the plant shut down and have engaged in dozens of similar actions since December 2005. November 2008: About 15 people held a rowdy protest against Vermont Yankee in the offices of the Public Service Board that regulates utilities. April 2009: A rally and two full-page advertisements in The Burlington Free Press, which mocked the Vermont Yankee Power Plant, were paid for by a newly formed group, The Clean Green Vermont Alliance. September 2009: Frances Crowe and three other women were arrested for non-violent civil disobedience at the Vermont Yankee nuclear power plant. On February 24, 2010, a large number of anti-nuclear activists and private citizens gathered in Montpelier to be at hand as the Vermont Senate voted 26 to 4 to not issue the Vermont Yankee reactor the "Public Good" certificate it needed for continued operation past 2012. Under Vermont law the re-license would have to be approved by both houses to continue operation. March 2011: 600 people gathered for a weekend protest outside the Vermont Yankee plant. The demonstration was held to show support for the thousands of Japanese people who are endangered by possible radiation from the Fukushima I nuclear accidents. March 2012: More than 130 protesters were arrested at the corporate headquarters of the Vermont Yankee nuclear power plant, on the first day of the plant's operation after the expiration of its original 40-year license. March 2013: More than 500 people, carrying banners and chanting "shut it down", marched through downtown Brattleboro in protest against Vermont Yankee. On August 27, 2013, Entergy announced in a press release that it would close Vermont Yankee by the end of 2014, and the plant ceased operations on Dec. 29, 2014. August 6, 1977: about a thousand anti-nuclear protesters marched outside the San Onofre nuclear generation station, while units 2 & 3 were under construction. June 22, 1980: about 15,000 people attended a protest near San Onofre Nuclear Generating Station in California. March 2012: 200 activists protested the San Onofre Nuclear Generating Station to mark the one-year anniversary of the nuclear meltdowns in Fukushima, Japan. On June 7, 2013, Southern California Edison announced it would "permanently retire" Unit 2 and Unit 3, ending their attempt to restart the plant at a reduced capacity. The Livermore Action Group organized many mass protests, from 1981 to 1984, against nuclear weapons which were being produced by the Lawrence Livermore National Laboratory. Peace activists Ken Nightingale and Eldred Schneider were involved. On June 22, 1982, more than 1,300 anti-nuclear protesters were arrested in a nonviolent demonstration. More recently, there has been an annual protest against nuclear weapons research at Lawrence Livermore. In August 2003, 1,000 people protested at Livermore Labs against "new-generation nuclear warheads". In the 2007 protest, 64 people were arrested. More than 80 people were arrested in March 2008 while protesting at the gates. International Day of Nuclear Disarmament protests were held on June 20, 1983 at 50 sites across the United States. Many of the protests were against corporations involved in nuclear weapons production. Almost a thousand members of the Livermore Action Group were arrested at one demonstration. In 1986, hundreds of people walked from Los Angeles to Washington, D.C. in what is referred to as the Great Peace March for Global Nuclear Disarmament. The march took nine months to traverse 3,700 miles (6,000 km), advancing approximately fifteen miles per day. Yankee Rowe Nuclear Power Plant, shut down in 1992, was subject to years of protests by environmentalists. January, 1987: The actor Martin Sheen and 71 other anti-nuclear protesters were arrested at the Nevada Test Site in a demonstration marking the 36th anniversary of the first nuclear test there. February 5, 1987: More than 400 people were arrested, when they tried to enter the nation's nuclear proving grounds after nearly 2,000 demonstrators held a rally to protest nuclear weapons testing. Those arrested included the astronomer Carl Sagan and the actors Kris Kristofferson, Martin Sheen, and Robert Blake. Five Democratic members of Congress attended the rally: Thomas J. Downey, Mike Lowry, Jim Bates, Leon E. Panetta and Barbara Boxer. August 9, 1987: A total of 228 people demonstrating against nuclear weapons were arrested at the Nevada Test Site. September 30, 1987: 110 demonstrators, including seven pediatricians, were arrested for civil disobedience; charges were later dropped. March 20, 1989: 75 protesters, including Louis Vitale, were arrested for trespassing in a peaceful Palm Sunday demonstration. April 20, 1992: 493 anti-nuclear protesters were arrested on misdemeanor charges, as demonstrators clashed with guards at an annual Easter demonstration against weapons testing at the remote desert site. August 6, 1995: 500 people gathered to mark the fiftieth anniversary of the bombing of Hiroshima. 1997: Over 2,000 people turned out for a demonstration and 700 were arrested. August 2005: About 200 peace activists, including actor Martin Sheen, gathered for a nonviolent demonstration outside the gates; dozens were given citations and released after crossing police lines. May 2006: 200 activists protested the Divine Strake explosives test, and 40 were arrested. April 2007: Nevada Desert Experience protest, where 39 people were cited by police. Since 1988, Oak Ridge Environmental Peace Alliance has organized non-violent direct action protests at the Y-12 National Security Complex, in an effort to close down the weapons plant. Sister Mary Dennis Lentsch, a Catholic nun, has been arrested many times for protesting at the Oak Ridge facility. She has said, "I believe the continuing weapons production at the Y-12 National Security Complex in Oak Ridge, Tennessee, is in direct violation of the treaty obligations of the United States and consequently, is a violation of Article 6 of the US Constitution”. In 2011, Rev. Bill Bichsel, an 84-year-old priest, received a prison sentence of three months for trespassing on federal property at the Y-12 complex. In 2012, there have been protests about the proposed new Uranium Processing Facility, which is expected to cost $7.5 billion. In July 2012, Megan Rice, an 82-year-old nun and two fellow pacifists entered the Y-12 complex and spray-painted antiwar slogans on a building that houses nuclear bomb fuel. The anti-nuclear activists, who got past fences and security sensors before dawn on July 28, spent several hours in the Complex, conducting a Christian peace ritual, before they were stopped by a lone guard. The security breach prompted private experts to criticize the Department of Energy’s safeguarding of nuclear stockpiles. The agency is to reappraise security measures across its nuclear weapons program. January 19, 2008: Seventeen people protesting about nuclear weapons at Naval Base Kitsap at Bangor in honor of Martin Luther King. Jr. were detained or arrested. All were released shortly afterward. May 30, 2008: Twelve people were arrested at an anti-nuclear weapon demonstration at Naval Base Kitsap-Bangor — five of them for walking on a sidewalk closed to pedestrian traffic. November 2, 2009: Five protestors, including Jesuit Priest William J. Bichsel, S.J. were arrested for breaking through two levels of security to protest the nuclear weapons stored at the base. The protesters walked to a bunker where the weapons were stored and spilled blood, hung posters and prayed. Thomas, Concepcion Picciotto and Ellen Thomas are the founders of the longest running anti-nuclear peace vigil in the US at the White House Peace Vigil, Lafayette Square, Washington, D.C.
April 5, 1990: Culmination of a campaign in rural Allegany County, where hundreds of protesters stopped state officials from surveying a potential nuclear waste dump site. May 1, 2005: 40,000 anti-nuclear/anti-war protesters march past the UN in New York, 60 years after the atomic bombings of Hiroshima and Nagasaki. 2008–2013: Protests about several proposed nuclear reactors. ^ Giugni, Marco (2004). Social Protest and Policy Change: Ecology, Antinuclear, and Peace Movements p. 44. ^ a b Giugni, Marco (2004). Social Protest and Policy Change: Ecology, Antinuclear, and Peace Movements p. 45. ^ a b c Williams, Estha. Nuke Fight Nears Decisive Moment Valley Advocate, August 28, 2008. ^ a b Jonathan Schell. The Spirit of June 12 The Nation, July 2, 2007. ^ a b Harvey Klehr. Far Left of Center: The American Radical Left Today Transaction Publishers, 1988, p. 150. ^ a b 1,400 Anti-nuclear protesters arrested Miami Herald, June 21, 1983. ^ a b Hundreds of Marchers Hit Washington in Finale of Nationwaide Peace March Gainesville Sun, November 16, 1986. ^ a b Robert Lindsey. 438 Protesters are Arrested at Nevada Nuclear Test Site The New York Times, February 6, 1987. ^ a b 493 Arrested at Nevada Nuclear Test Site The New York Times, April 20, 1992. ^ a b Lance Murdoch. Pictures: New York MayDay anti-nuke/war march Archived 2011-07-28 at the Wayback Machine IndyMedia, 2 May 2005. ^ a b Anti-Nuke Protests in New York Archived 2010-10-31 at the Wayback Machine Fox News, May 2, 2005. ^ a b Matthew Wald (June 14, 2013). "Nuclear Plants, Old and Uncompetitive, Are Closing Earlier Than Expected". The New York Times. ^ a b Paula Garb. Critical Masses: Opposition to Nuclear Power in California, 1958–1978 (book review) Journal of Political Ecology, Vol 6, 1999. ^ Office of Technology Assessment. (1984). Public Attitudes Toward Nuclear Power p. 231. ^ a b Woo, Elaine (January 30, 2011). "Dagmar Wilson dies at 94; organizer of women's disarmament protesters". Los Angeles Times. ^ a b Utilities Drop Nuclear Power Plant Plans Ocala Star-Banner, January 4, 1981. ^ No nukes by Anna Gyorgy pp. 393–394. ^ 30 years later, another nuclear struggle looms The Daily News, April 30, 2007. ^ a b c d Gunter, Paul. Clamshell Alliance: Thirteen Years of Anti-Nuclear Activism at Seabrook, New Hampshire, U.S.A.Ecologia Newsletter, January 1990 Issue 3. ^ a b c d e Williams, Eesha. Wikipedia distorts nuclear history Valley Post, May 1, 2008. ^ William A. Gamson and Andre Modigliani. Media Coverage and Public Opinion on Nuclear Power[permanent dead link], American Journal of Sociology, Vol. 95, No. 1, July 1989, p. 17. ^ Gold, Allan R. Hundreds Arrested Over Seabrook Test The New York Times, June 5, 1989. ^ a b Daniel Pope. Conservation Fallout (book review), H-Net Reviews, August 2007. ^ a b c Social Protest and Policy Change p. 44. ^ a b Amplifying Public Opinion: The Policy Impact of the U.S. Environmental Movement p. 7. ^ Gottlieb, Robert (2005). Forcing the Spring: The Transformation of the American Environmental Movement, Revised Edition, Island Press, USA, p. 240. ^ Arrests Exceed 900 In Coast Nuclear Protest The New York Times, September 18, 1981. ^ Testing and Protesting Time, May 14, 1984. ^ Julia Hickey (April 17, 2001). "Anti-nuclear rally at Avila Beach". The Tribune. Archived from the original on 2012-03-22. ^ a b Daniel Pope. Anti-Nuclear Movement The Oregon Encyclopedia. ^ Pershing 1996, p. 150. ^ Steele, R. David (October 1985). "The World Is Comin' to a Start – Peace Ribbon Brings Hope and Community". Sequoia. Northern California Ecumenical Council: 3. ^ "'Ribbon' Documentary". The Ribbon Newsletter. October 1985. ^ Weil, Dorothy (November 1986). "Peace Packages Around The Pentagon". Cincinnati Magazine: 155–157. Retrieved 2014-06-28. ^ Wilcox, Don (October 1985). "Peace Ribbon Wraps Washington In Largest Collaborative Craft Event In American History". The Craft Report: 10. ^ Sanders, Steve (August 5, 1985). "'Peace Ribbon' Tied Around The Capitol". Chicago Tribune. Retrieved 2014-06-28. ^ Pershing 1996, p. 154. ^ David S. Sills et al. (1982). Accident at Three Mile Island: The Human Dimensions, Westview Press, p. 11. ^ Interest Group Politics In America p. 149. ^ a b "Saga Behind the Shoreham Nuclear Plant Retold". Archived from the original on 2011-07-24. Retrieved 2009-06-13. ^ Shoreham and the rise and fall of the nuclear power industry p. 6. ^ a b Fagin, Dan (2007-05-29). "Lights Out at Shoreham". Newsday. Archived from the original on 2007-12-01. Retrieved 2007-08-30. ^ Shoreham Action Is One of Largest Held Worldwide; 15,000 Protest L.I. Atom Plant; 600 Seized 600 Arrested on L.I. as 15,000 Protest at Nuclear Plant Nuclear Supporter on Hand Governor Stresses Safety Thousands Protest Worldwide The New York Times, June 4, 1979. ^ Planning the Fate of a Nuclear Plant’s Land The New York Times, January 1, 2009. ^ Nonviolent Social Movements p. 295. ^ a b "570 Arrested in A-Bomb Protests". The New York Times. August 10, 1987. ^ Frank Trippett and Robert W. Hollis. Shutting Down Rancho Seco TIME, June 19, 1989. ^ "Eleven arrested in latest protest over Vermont Yankee". Archived from the original on 2016-03-03. Retrieved 2018-08-21. ^ "Yankee Protesters Arrested". Archived from the original on 2007-06-13. Retrieved 2009-05-07. ^ Nuclear power foes not stilled in N.E. ^ "Activists stage anti-nuclear rally". Archived from the original on 2012-02-23. Retrieved 2018-08-21. ^ Eeesha Williams. Protesters Arrested at Vermont Yankee Valley Post, September 29, 2009. ^ Wald, Matthew (February 25, 2010). "Vermont Senate Votes to Close Nuclear Plant". The New York Times. ^ "Vermont Yankee: Countdown to closure". WCAX. March 21, 2011. Archived from the original on March 9, 2012. Retrieved March 22, 2011. ^ "Hundreds march in protest of Vermont Yankee plant". Boston.com. March 31, 2013. ^ Barbara Epstein. Political protest and cultural revolution: nonviolent direct action in the 1970s and 1980s University of California Press, 1993. pp. 125–133. ^ Diana Walsh (11 August 2003). "Nuclear Protest Blooms Again at Lab: 1,000 in Livermore Demonstrate Against New Buster Bomb". San Francisco Chronicle. Retrieved 23 June 2015. ^ Police arrest 64 at California anti-nuclear protest Reuters, April 6, 2007. ^ "Scores arrested during protest at Livermore Lab". Oakland Tribune. March 22, 2008. Archived from the original on May 12, 2013. ^ Growing in Christian Morality by Julia Ahlers, Barbara Allaire, Carl Koch p. 242. ^ Discourse analysis by Brian Paltridge p. 188. ^ "Survivors Join Activists, Call for Ban on Nukes on Anniversary of Atomic Blasts". Archived from the original on 2009-07-26. Retrieved 2009-06-14. ^ Frank Munger (July 5, 2010). "Y-12 protests nets dozens of arrests". Knox News. ^ Lance Coleman (April 21, 2012). "Protesters rally against new Y-12 uranium facility". Knox News. ^ Matthew L.Wald (August 7, 2012). "Security Questions Are Raised by Break-In at a Nuclear Site". The New York Times. ^ Colman McCarthy (February 8, 2009). "From Lafayette Square Lookout, He Made His War Protest Permanent". The Washington Post. ^ Mark Scott. 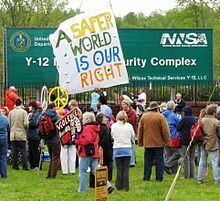 Allegany County residents mark 20th anniversary of nuclear dump protests Archived 2011-06-05 at the Wayback Machine WBFO News, April 9, 2010. ^ Sam Howe Verhovek. Nuclear Dump Plan Ignites Rural Protests The New York Times, September 19, 1989. ^ Earl F. Mulderink, III. Linked Arms: A Rural Community Resists Nuclear Waste (Review) The Oral History Review, Vol. 30, No. 2 (Summer – Autumn, 2003), pp. 159–161. Wikimedia Commons has media related to Protests against nuclear energy. Miller, Byron A. (2000). Geography and Social Movements: Comparing Anti-nuclear Activism in the Boston area, University of Minnesota Press.